“Gromit set loose” is on over the summer holidays. In it you try to find models of Gromit (from Wallace and Gromit.) Each sculpture is different because each one was designed by another person or artist like the Beano or Zayn from One Direction. There are 80 Gromits to find all over Bristol and a few in other towns. My sister and I found 39. It was really fun looking for the Gromits and sometimes we found some without meaning to. My favourite ones were a salty sea dog by Peter Lord, Gromit Lightyear by Pixar and Where’s Wallace? by Martin Handford. Overall it was a great thing to do in the holiday and if you want to do the trail, start looking in Bristol before the end of the summer holidays or as Wallace would say “get cracking lads ” It ends on September 8th. My mum says: Gromit Unleashed is a series of giant Gromits which have been designed by artists and others in order to raise funds for sick children. 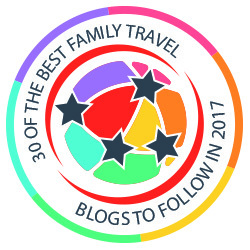 We’ve sent this post to Gretta at Mumsdotravel where she and others recommend other great family days out! UPDATE: We have now managed to visit the original Gromit, who is currently in London, at Paddington Station. Take a look at our little post and pics here. More by Robert on Beanotown at the South Bank in London and Cadbury World in Birmingham. You’re welcome. It was very fun. We visited Bristol a couple of times in the last couple of months and intended to find them all, but we haven’t been back since the Harbourside festival.Popping over from Family Days. I hope you had a amazing time. We did! Oh, the kids were so lucky to see him – just in time I think. Thanks so much for commenting.